Jim Davis, father of Vicki Stroud, was a Top Hand Award winner for the Red Bluff Round-Up. His daughter and her family are continuing the tradition of volunteering with the Round-Up. 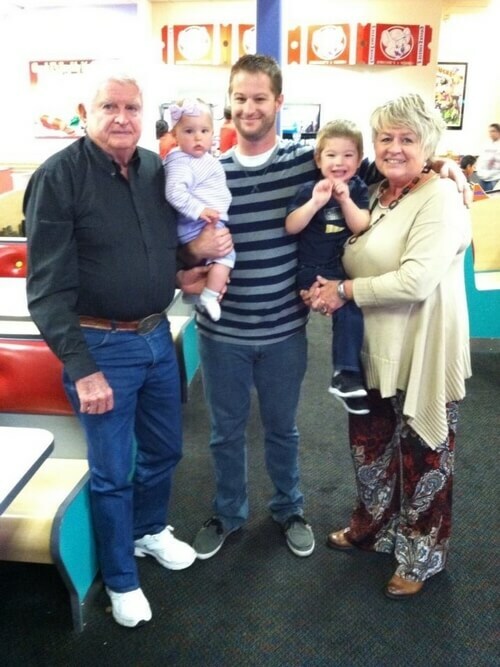 Four generations of the Davis family: Jim, grandson Wes, holding daughter Hayden, and Jim’s daughter and Wes’ mom Vicki, holding grandson Boden, gather. They have all attended the Round-Up. 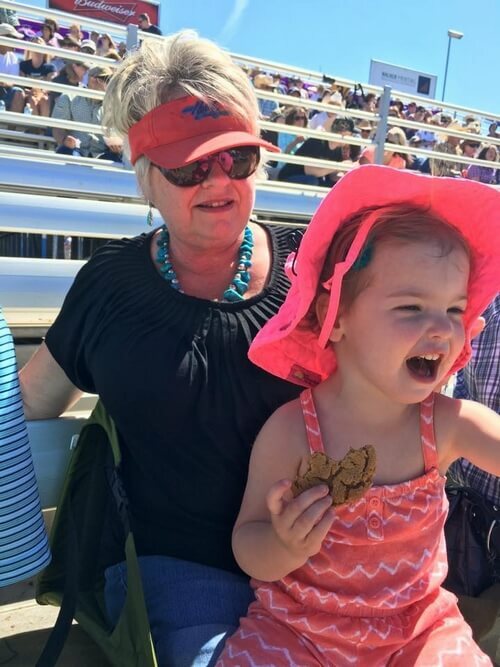 Vicki Stroud and granddaughter Hayden Stroud enjoy a performance of the Red Bluff Round-Up. Vicki is a long-time attendee and volunteer; Hayden is just getting started. 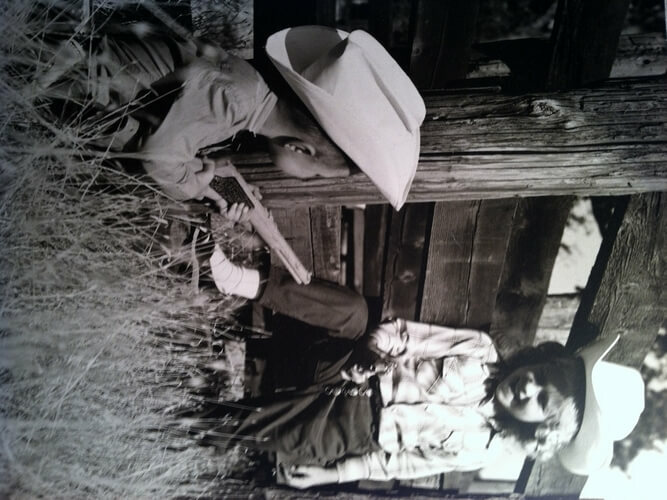 Vicki Stroud and her brother play cowboys as youngsters. Now, Stroud volunteers her time with the Round-Up. Red Bluff, Calif. – The Red Bluff Round-Up runs through the blood of Vicki Stroud. It’s a part of her family heritage, actually. Stroud, who was raised in Red Bluff, is the daughter of Jim Davis, long-time volunteer with the Round-Up, and the great-niece of Guy Davis, one of the original shareholders. Vicki has either attended or volunteered at the rodeo –or both – for at least sixty years, she estimates. Her dad, Jim, was a California Highway Patrolman for 27 years, taking a week off every April to volunteer his time at the Round-Up. He ran the timed event chute for fifty years, opening the chute for the calf or steer to run out of. 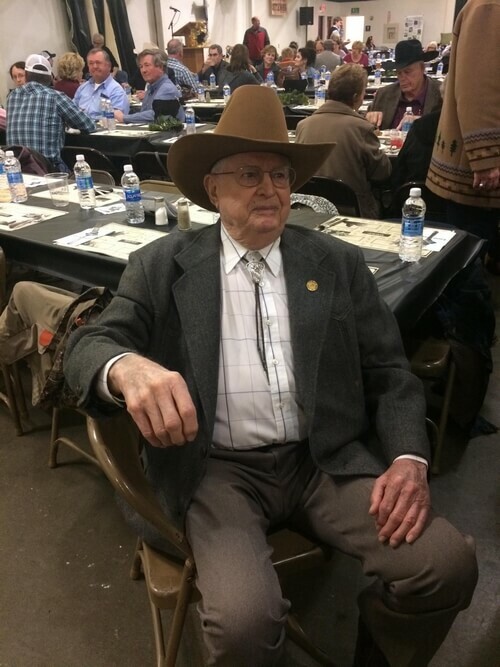 Stroud’s great-uncle, Guy Davis, has roots even deeper in the Round-Up. Born in 1887, Davis owned the Ford-Plymouth-DeSoto dealership on Main Street, and was president of the Red Bluff Chamber of Commerce in 1932. Guy promoted the Round-Up, realizing the economic impact rodeo goers had on Red Bluff businesses. He and other men went from town to town, in the 1930s, promoting the Round-Up. Guy passed his share on to his nephew Jim, who passed it on to Stroud. Even though she didn’t live on a farm, Stroud loved to ride horses. She and friends would pack a lunch and spend the day riding through the countryside. She was (and continues to be) good friends with Margo Growney Trujillo, and she would go to the Growney Ranch to help brand and work cattle. She never competed in rodeo, but she loved to go to the youth rodeos and watch Margo and other friends compete. She has many memories surrounding the Round-Up, like the time she and her friend Debbie Slattery Stone took her Volkswagon to the rodeo. A cooler of pop was situated over the battery, and when the ice melted, it ran all over the battery. “There we were, at the rodeo, looking for a jump,” she laughed. She remembers hearing stories of her dad, Jack Craig and Jim Owens saying they could never watch the parade because they always had to be at the rodeo. One year, they decided they would watch the parade. But instead of watching it, they borrowed someone’s old checker motor car and snuck into the parade line, becoming an entry in it! Jim was awarded the Top Hand Award, given to a volunteer who has dedicated their time in assisting with the rodeo. He was selected for the honor in the 1980s and at the time of his death in July of 2018, was the oldest living Top Hand Award winner. In Stroud’s younger years, she volunteered with some of the ancillary events surrounding the Round-Up, like the cowboy golf tournament. As a Red Bluff Rotarian, she helps man the beer booth, where proceeds go towards the Rotary’s scholarships. She also co-chairs the Think Pink luncheon, held on the Tuesday before the Round-Up (this year, April 16.) Proceeds from the Jolene Kemen Think Pink luncheon go to the Tough Enough to Wear Pink campaign, for cancer treatment at Dignity Health St. Elizabeth Community Hospital. Last year, the luncheon, along with its auction, raised $11,500, along with tips from the beer stands. Vicki and her husband Doyle’s children Wes and Matt are the third generation of Round-Up fans. Wes and Matt “have been going to the rodeo since they were in my belly,” she laughed. “They’d sit at the rodeo through the wind and the cold. Not too many times did we miss the rodeo.” And the fourth generation is starting. Wes and Lauren’s children, daughter Hayden and son Boden, go to the rodeo with their family. Vicki’s brother Jimmy Davis has entered the wild horse race at the Round-Up, and Doyle is a volunteer at the Round-Up Mercantile in downtown Red Bluff. The 98th annual Red Bluff Round-Up takes place April 19-21 at the Tehama District Fairgrounds in Red Bluff. Performances start at 7 pm on April 19, at 2:30 pm on April 20, and at 1:30 pm on April 21. Tickets range in price from $14 to $35 and can be purchased online at www.RedBluffRoundup.com. Call the Round-Up office at 530.527.1000 for more information.